An iMac computer from August २००९, a modern all-in-one Macintosh. 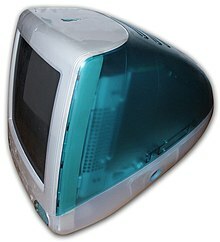 The original "Bondi Blue" iMac G3. Introduced in १९९८, it led Apple's return to profitability. However, the associated mouse proved to be one of consumers' least favorite Apple products.